Manager Justin Edinburgh said Zebroski suffered a dislocated his knee cap during the 1-1 draw in the FA Cup first round. League Two Newport have been hampered by injuries so far this season, much to the frustration of Edinburgh. "He's in some discomfort and it's not looking promising right now," he said. "That's just how are luck is going at the moment." Zebroski's injury is the latest in a long list of injuries which have affected Newport's first season back in the Football League for 25 years. Striker Aaron O'Connor has not played this season and faces further groin surgery which will rule him out until the New Year. Another player who is out until the New Year is defender Byron Anthony, who suffered a broken leg in the Capital One Cup win at Brighton in August. Lee Minshull, Adedeji Oshilaja, Andrew Hughes, Andy Sandell and Max Porter are also currently sidelined. 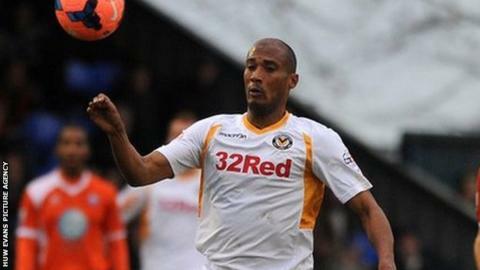 Zebroski's injury came during a game in which Newport came back to earn a first round replay against Conference Premier side Braintree. "We're having a horrendous run [with injuries] and it really took the gloss off a great second half," Edinburgh added. "I don't know what we've done to get this horrendous run of injuries."